DALLAS, August 7, 2006  With the beat of a drum, the blow of a whistle, and the blare of the brass section, marching bands across the country are practicing formations and new musical routines in anticipation of the start of the school year. Recognizing the unique needs of these performers, the National Athletic Trainers' Association (NATA) has issued timely guidelines to ensure safety on the field and in the parade line. "Marching band members, just like athletes, need to be well conditioned and prepared for the rigors of band practices and performances. These unique athletes are often in formations for long periods of time, wearing heavy clothing in warm weather conditions, and carrying instruments that require dexterity and strength," said Brian Robinson, MS, ATC, chair of NATA's Secondary School Athletic Trainers' Committee. "It's critical for band directors to work closely with school athletic trainers and medical professionals to develop a safety protocol to ensure band members march on the field fit to perform at their best." Prepare for Activity: Students participating in marching bands should receive a general health exam prior to activity to make sure they are fit to perform. Be sure to discuss any pre-existing conditions with the physician. 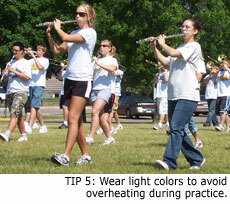 What to Wear: Wear light or white colored shorts and t-shirts to avoid overheating during practice. This is especially important for anyone carrying heavy instruments for long periods of time. Save the formal attire  heavy hats, dark clothing and shoes  for dress rehearsals and get comfortable in them before game day. Be aware that the weight of the material and dark colors keep heat "in." Hydrate, Hydrate, Hydrate: Establish a hydration plan that allows band members to drink water or sports drinks such as Gatorade throughout practice sessions (about 7-10 ounces every 10-20 minutes). It is important to hydrate before AND after routines. Without proper hydration, they are at risk of developing exertional heat related illnesses. Make sure that band members have sports drinks and water should always be available. Don't assume they can share with sports teams. Stay Fit in Formation: Since bands are often in formation and standing still for long periods of time  especially when on parade routes or during practice  students should move fingers, knees and toes slightly to keep circulation flowing and joints loose and flexible. "Athletic trainers are always on the frontline should a band member not feel well or need immediate care in the event of injury or illness, said Robinson. "Our goal is to prevent the injury from happening in the first place. By putting these guidelines into practice, band directors and their members can enjoy a season rich in music and highly spirited routines." For more information on youth sports and sports safety, please visit http://www.nata.org/youthsports/. About the National Athletic Trainers' Association (NATA): Athletic trainers (ATCs) are unique health care providers who specialize in the prevention, assessment, treatment and rehabilitation of injuries and illnesses. The National Athletic Trainers' Association represents and supports 30,000 members of the athletic training profession through education and research.